Pudgy, flatulent white thing travels the world in search of wayward lips and eats a lot. You’re familiar with Yo! Noid, right? Short-lived Domino’s Pizza mascot gets his own NES game from Capcom (which used to be something else entirely) and enjoys a sliver of success before eventually dying at the hands of marketing? Of course. Well, before Yo! Noid we hadn’t really seen a game based on based on an advertising campaign or coporate mascot (aside from Kool-Aid Man on the Atari 2600, but that’s defeating my point). But as usual, in Japan it’s a little bit different. The situation is similar, but the numbers are bigger. Much like celebrated web culture icon Domo-kun, Hachiemon is the mascot for a television network, in this case Kansai Television. And like Domo-kun, Hachiemon now has his very own GBA game, brought to us from Namco. Hachiemon’s tale of tragedy begins when he and his closest friends are having a simple day of fun. Suddenly, all their lips disappear except his! Soon it’s discovered that the lips of various creatures all over have also disappeared. Our egg-shaped friend discovers an evil plot devised by a band of sunglass-wearing bad guys, and immediately makes it his goal to recover the world’s lips and put a stop to the evildoers. 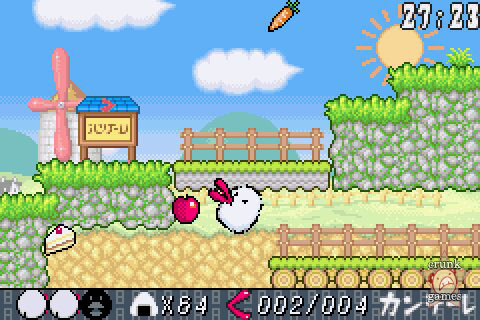 As for the game itself, Hachiemon is a striking throwback to the SNES days, moreso than any other half-baked attempt on the GBA. The bright, simple graphics and overly boopy (but catchy!) music will have you wondering if it’s an obscure Super Famicom port. This makes it sound unoriginal, but it has its own unique touches, like Hachiemon’s farting idle animation or, upon kissing a female Hachiemon she soon births a baby 1-up. You know, just some things to keep it fresh. 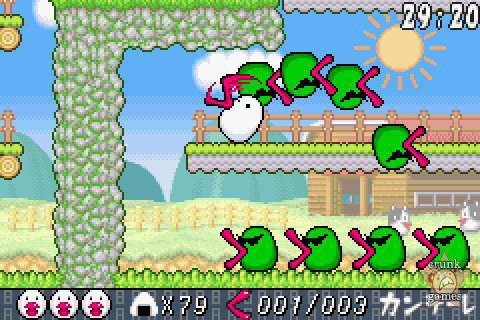 Control uses all four action buttons, with A for jumping and B stretching out Hachiemon’s lips to grab items, latch onto ledges, or kiss enemies in order to faze and kill them. You can also have him slingshot himself across the screen with the technique. Pressing down and A enables a roll attack. 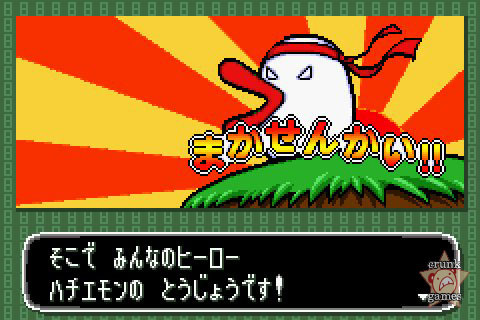 R lets Hachiemon throw his own lips like a boomerang as an attack or to catch faraway items. L lets out Hachiemon’s "Kantele" roar and acts as a sonar, flashing any nearby lips or items. Every stage is a testing ground for every technique, which, design-wise is rather pleasant. Players have about 30 minutes per stage to collect a certain number of lips and make it to the end. Half the time lips will be hidden in special "lip blocks" that Hachiemon will have to plow through with his roll attack. Any extra lips will be added to the food total (100 food items nets a 1-up). Getting the lips is the easy part, since you’ll only need to get a handful each time, but you can only get 100% completion by getting every set of lips in each stage. Hachiemon can also pick up special power-ups that will transform him into some weird form in order to clear the stage. There’s a samurai, fish, a simple penguin suit and a number of other goofy configurations.